Charles Matthews An unusual point about approach moves occurred in one of my games. Approach moves from the corner? When it first came up, there was no real reason to anticipate a capturing race - hindsight is always a wonderful thing. 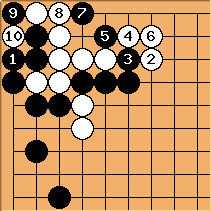 In a position similar to this one, White has just played the marked stone, and therefore threatens to capture Black's marked stones by oi otoshi. At this stage of the game Black wants to defend those stones, so that the white group on the upper side remains weak. Tactically speaking Black might do that at a, b or c.
Black a, a potentially good empty triangle, can have an advantage here. 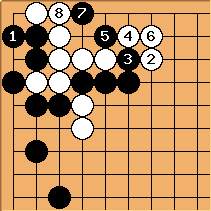 If Black plays b or c White may play an immediate kikashi at a. Supposing Black wants to maintain the attack on the white group, Black will answer (at c or b respectively), and then Black has some shortage of liberties here (involving a corner ko). There is this small but perceptible change if is played this way. After as an approach move, captures three stones but only makes one eye. So only makes a half eye. This has some effect on the fighting around the point x. On the other side of the argument, you could say that playing Black c in the first diagram tempts White into a small endgame loss (White at b then probably costs points). 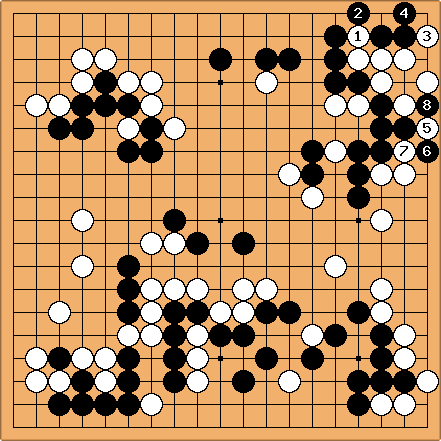 In the particular game in question I as Black succumbed later in the game to the lack of liberties. I'm not able to reconstruct the precise reason (it was a lightning game); but I've always found this striking. DaveSigaty: I think that Black may be looking too far into the future in choosing the original empty triangle play. 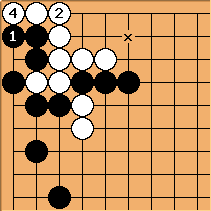 Until Black adds another move to eliminate the bad aji on the left, White's chances are considerably enhanced by the ability to make 1 eye + ko. This is not a ko that Black can afford to lose. So Black will have to answer ( in the diagram above). Black ends up having time to connect against the atari of (see below). White can not realistically play here: she must hold back at instead. Charles While I'm still convinced this mattered in the game that set off this train of thought, it is certainly a rarity in pro games. 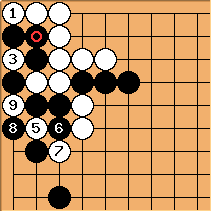 This idea does occur in a game 1997-08-26 Cheong Su-hyeon(B) -Zhou Heyang, where the reason is related to local ko threats.